When Will Vinton and Bob Gardiner won their Oscar in 1975, independent filmmaking in Oregon seemed to be entering a new stage. But the truth is that Oregon already had produced four successful independent filmmakers: James Ivory (b. 1928), James Blue (1930-1980), Harry Smith (1923-1991) and Homer Groening (1919-1996). All four artists had emerged a decade before Vinton and Gardiner made their breakthrough film. Ivory made his cinematic debut from India. Blue made his from Algeria. Smith made his from New York City. Groening remained in Portland, splitting his time between his advertising work and his short art films, which he sent to film festivals around the world. In the Mid Century Oregon Genius screening series, we unite these four Oregon mid-century film artists under one umbrella. One film is shot in an Algerian war zone. One stars a Hollywood heart throb. One is shot on an animation stand which doubled as a bed for the filmmaker. Some are shot underwater. On Oct. 10 at 7:00 PM, three time Oscar nominee James Ivory comes to Portland to introduce MAURICE (1987), starring James Wilby, Hugh Grant and Rupert Graves. Handpicked by Ivory for the screening series, MAURICE is on the short list of films for which he served as both screenwriter (with Kit Hesketh-Harvey) and director. James Ivory grew up in Klamath Falls and graduated from the University of Oregon in 1951. On Oct. 11 at 11:00 AM at the Hollywood, we will screen James Ivory’s AUTOBIOGRAPHY OF A PRINCESS (1977), starring Madhur Jaffrey and James Mason. Ivory chose AUTOBIOGRAPHY specifically to complement James Blue’s THE OLIVE TREES OF JUSTICE, which shares its theme of post colonial identity crisis. On Oct. 11 at 1:00 PM, Richard Blue, the brother of director James Blue, will introduce THE OLIVE TREES OF JUSTICE, an extremely rare film which won the Critics Prize at Cannes in 1962. James Blue grew up in Portland and graduated from the University of Oregon in 1953. He and James Ivory worked together on at least one drama production at UO. Did they have any idea they would become Oregon’s first Oscar nominated directors? And that they both would launch careers from outside this country? On Oct. 11 at 2:30 PM, following the screening of THE OLIVE TREES OF JUSTICE, there will be a panel discussion titled James Blue, a life in conversation. Three panelists will talk us through James Blue’s life and career. Using archival photos from the Blue Collection to structure the narrative, we will travel conversationally from Tulsa to Portland, Eugene, and Paris, to Blue’s professional breakthrough in Algiers, his subsequent embrace of documentary, and his dual identity as filmmaker and educator. The panelists are Richard Blue, the brother of James Blue; James Dormeyer, Blue’s classmate at L’Institut des hautes études cinématographiques in Paris and a close friend; Gill Dennis, the screenwriter of Blue’s 1969 Oscar nominated doc, A FEW NOTES ON OUR FOOD PROBLEM. Tickets for individual events, and for the entire series, will be available online through The Hollywood Theatre and at the door. The Mid Century Oregon Genius screening of The Olive Trees Of Justice is co-sponsored by The James and Richard Blue Foundation. 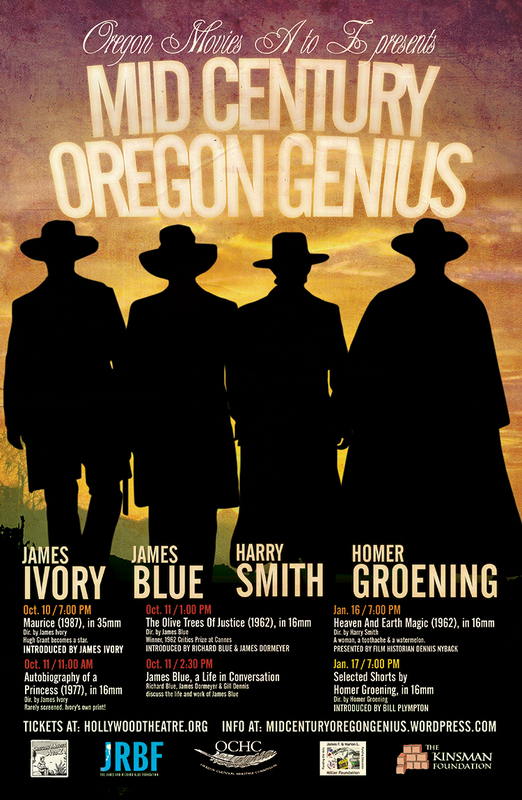 The second half of the Mid Century Oregon Genius screening series will take place on January 15 & 16, 2015. Two back to back evenings will celebrate the work of independent filmmakers Harry Smith and Homer Groening. The Mid Century Oregon Genius screening series is supported by grants from Kinsman Foundation and Miller Foundation. It is presented by Oregon Movies, A to Z, which is fiscally sponsored by Oregon Cultural Heritage Commission, a 501 c3 private non profit organization.